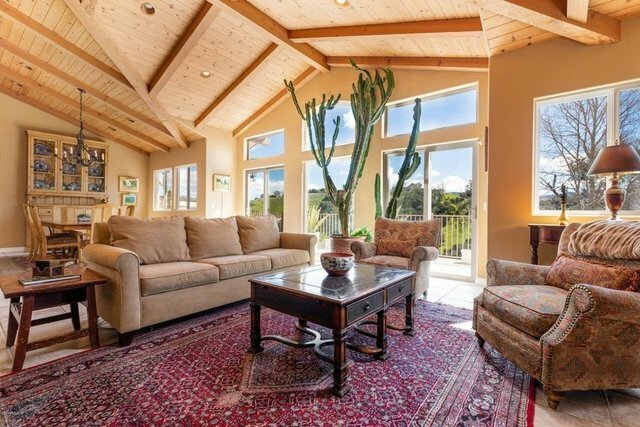 Enjoy wonderful mountain views through the walls of glass in this beautiful home, with open floor plan for entertaining. Spacious gourmet kitchen for today's modern living, with vaulted ceilings, island, breakfast bar, walk-in pantry and cheery window overlooking the professionally landscaped courtyard. Living room with vaulted, wood beamed ceilings, built-in sound system, corner fireplace, picture windows and glass doors to the views. Dining room gracious enough to accommodate large gatherings. Spacious master suite complete with soaking tub, walk-in closet, fireplace and doors that lead to the spa on the deck. Walled and gated for privacy with lawns, gardens and olive trees. Three bedrooms, three baths plus office/4th bedroom, and attached 3-car garage with additional storage.